We're here again with another MFT Color Challenge! Join us as we create with this vivid color combination. This challenge features vibrant colors to inspire you — Razzle Berry, Orange Fizz, Cornflower, and Green Room. 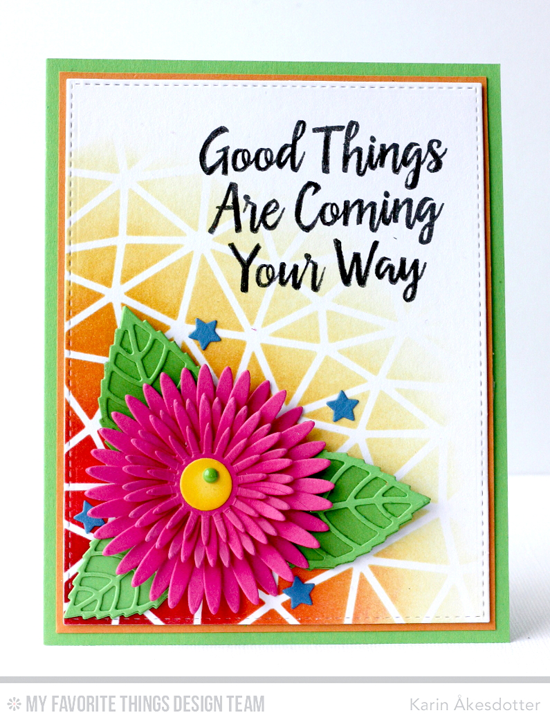 The Pretty Posies stamp set and Die-namics look stunning on Barbara's gorgeous card for Color Challenge 45! Nestled atop a feminine scalloped oval and a textural background created with the One Way Chevron stencil, this card exudes beauty. And that sentiment is spot on perfection! Julie pumps up the color factor using the Diagonal Sentiment Strip Cover-Up Die-namics with this vivid palette. The gloss on the Hello There Die-namics gives her design some extra sass! Karin concentrates on the Orange Fizz of the color combination with her vibrant use of the Abstract stencil. The Layered Leaves look super fantastic in Green Room and play well with the Razzle Berry Gerbera Daisy. 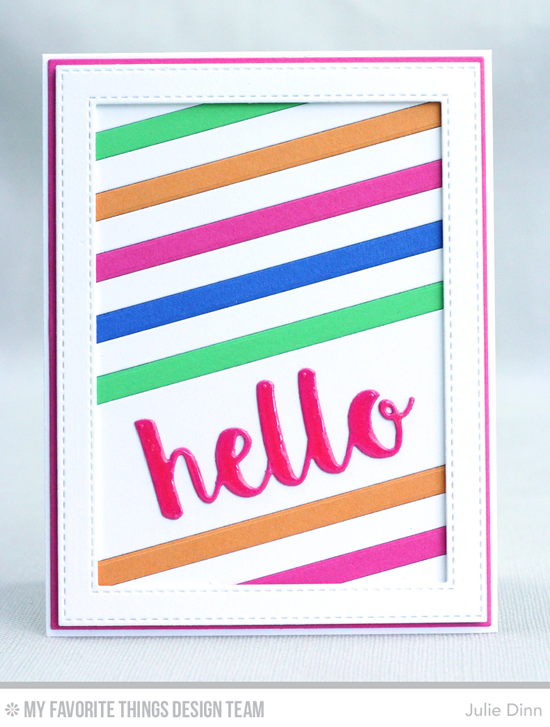 Jodi pulled out the Circle Burst stencil for her magnificently colorful card! The sentiment in white on black with the sparkly green underline send this design into the stratosphere of pure AWESOME! Congratulations, Lynn Put! You are the randomly selected winner of the MFT Color Challenge. You can view all the entries from the last challenge HERE. You have until Wednesday, May 25th, at noon EDT to add your link and be eligible for the prize of up to $20 in MFT Cash. Winners are chosen at random, so everyone has a chance! The prize is a $15 Gift Voucher to My Favorite Things, but if you use MFT stamps and/or dies in your project, you’ll receive an extra $5. How will this color combination inspire YOU? We can't wait to see. Yahoo!!! Thank you so much! My wish list is long and the gift certificate is much appreciated.